New Jersey has been developing densely and extensively along its 125-mile coast and fragile barrier islands for more than three centuries. 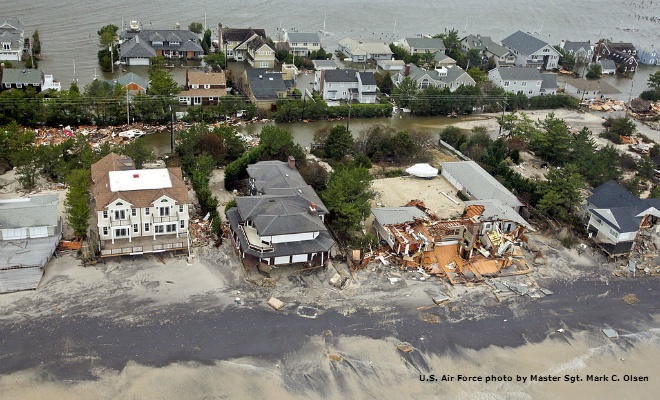 Hurricane Sandy was a wake-up call that storms are becoming increasingly frequent, severe and destructive as sea levels rise more and more rapidly. As a result, there is a growing awareness of the need to rethink the state’s development patterns. And because these growing threats ignore municipal borders, they seem to call for a regional response. This roundtable discussion explored what that response might look like and how it could be implemented to help us begin to reimagine our coast. Carleton Montgomery, executive director of the Pineland Preservation Alliance and the panel moderator, noted that municipalities have authority to control their own land uses, but they have no control over their neighbors’ land uses. The landmark Pinelands Act has a broader perspective but it has no authority in coastal areas. These areas are regulated in part under the Coastal Area Facilities Review Act (CAFRA), which was not designed to address climate change and sea level rise. Mr. Montgomery asked the panel: What new super-municipal mechanisms should be considered to address the impacts of climate change and sea-level rise along New Jersey’s coast? 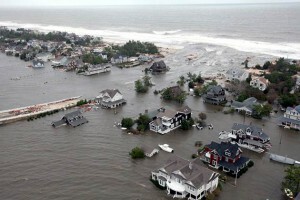 Understanding the Threat: Tom Wright, president of the Regional Plan Association, highlighted RPA’s recently issued Under Water, a study detailing the severe threats posed to the region’s bay areas, coastal urban centers, beach communities, airports, and seaports as sea levels rise. According to the study, these areas will be threatened with inundation by as little as one foot of sea level rise, which the area is expected to experience as soon as the 2030s. 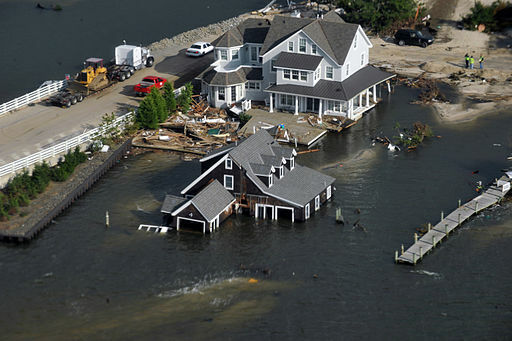 Mr. Wright noted that sea level rise has the potential for impacts equal to those of storm surge, and that he sees a major disconnect between current land use policies and these looming threats. One approach, he suggested, might be to recast the coast as a major parkland and establish a resiliency commission, similar in form and authority to the Pinelands Commission, to interact with and assist municipalities in overseeing the area. Local Officials Want Guidance: Jeanne Herb, associate director of environmental analysis and communications at Rutgers’ Bloustein School, noted that on behalf of the New Jersey Climate Adaptation Alliance, Rutgers University convened a Science and Technology Advisory Panel to integrate science into land use policy. Local officials with whom they conferred indicated that they needed consistency from federal and state agencies and wanted strong guidance and a science-based approach to help them address climate change at the local level. Obstacles and Solutions: Tim Dillingham, executive director of the American Littoral Society, noted that the local tax system poses a big impediment to regional solutions. Municipalities would be more likely to work together if they weren’t competing with one another for tax revenues. He noted that a public debate is needed to address the clear lack of consensus about whether the coast is as vulnerable as science says it is. Debbie Lawlor, former chief planner at the New Jersey Meadowlands Commission (now the New Jersey Sports and Exposition Authority) and currently a planning consultant for Maser Consulting, noted that the Meadowlands Commission had authority over local zoning that superseded local control. She indicated that the commission attempted to direct uses to locations where they made the most sense and that tax-sharing mechanisms were in place to reduce municipalities’ competition for local revenues. She suggested the Meadowlands Commission might be a useful model for regional coastal management. All participants agreed that over time it will be infeasible for municipalities and the state to continue to invest in infrastructure and services in support of areas increasingly at risk. However, in the absence of a clear vision, they acknowledged that communities don’t have a good concept of what the shore should/would be, and so have merely returned to what they were doing before Sandy. A coastal plan that establishes lower-risk areas to which growth can be directed is clearly needed, they said, along with incentives to make it work. They noted that when regional plans have been prepared in the past they have worked. But, they lamented, issues of trust and a predisposition against planning initiatives will present major obstacles.